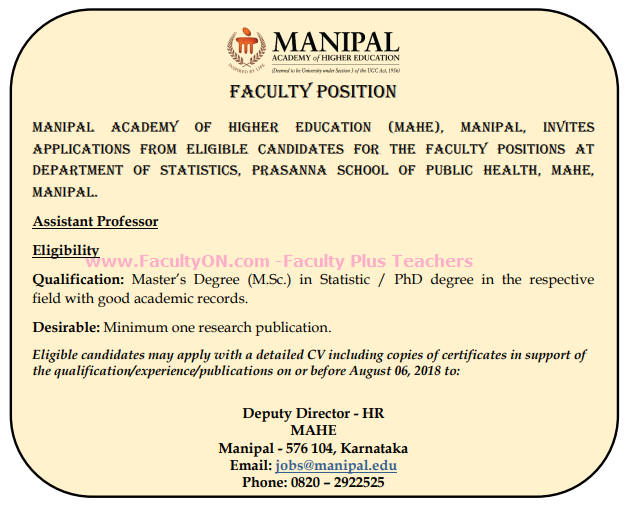 Manipal University, Manipal, has advertised for the recruitment of Teaching Faculty- Assistant Professor jobs vacancies. Interested and eligible job aspirants are requested to apply on or before 07th August 2018. Check out further more details below. About University: Manipal University is synonymous with excellence in higher education. Over 28,000 students from 57 different nations live, learn and play in the sprawling University town, nestled on a plateau in Karnataka’s Udupi district. It also has nearly 2500 faculty and almost 10000 other support and service staff, who cater to the various professional institutions in health sciences, engineering, management, communication and humanities which dot the Wi-Fi-enabled campus.